We provide custom home construction, home remodeling, home additions, kitchen remodeling, bathroom remodeling and more in Eau Claire, WI. We provide services for the Eau Claire area. in our beautiful dream home. 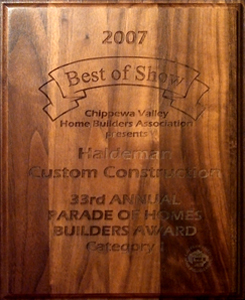 Why choose Haldeman Builders? 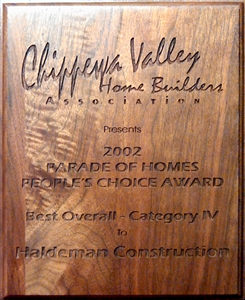 Charles Haldeman has been in the construction trade for over eighteen years. 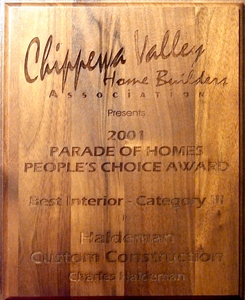 His workmanship has been highlighted in several award-winning parade homes. Chuck is known by his customers as being a good listener, offering choices and solutions to their wants and needs. From starter homes to the home of your dreams, Haldeman Builders will guide you through each step of the building process. Our project management focuses on efficient and timely completion with the craftsmanship you require. Our approach and commitment to customer satisfaction is the foundation of our success. We have designed our team with a customer first philosophy. The question, "What could the customer want?" drives our operation. 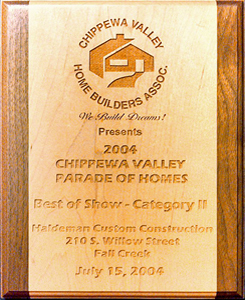 From our years in the business and a desire to truly listen to our customers, we have determined that a quality product, honesty and integrity, open communications, flexible home designs, respect for the customer's time and money, as well as a being a resource for services and maintenance is what our customers want from their new home builder. With today’s rising costs of energy and LP, if you’re thinking of building a new home, there’s no better time than now. 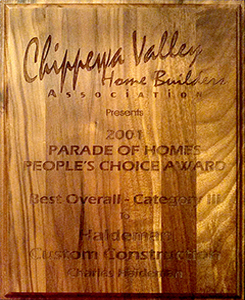 For the past eighteen years, Haldeman Builders has been constructing energy-efficient homes that have surpassed energy star standards. We strive to build quality craftsman homes at affordable prices. Our primary objective is to deliver superior homes with open floor plans perfectly matching your lifestyle. We provide outstanding customer service and recognize that no two homes should be the same because no two people or families are the same.